The Bible covers in many places that in the end times there will be a spirit of deception that will go out and deceive people into believing in false Christs and false prophets. One of the places where this is mentioned is in 2 Timothy 4, beginning with verse 2. It goes, "Preach the Word; be prepared in season and out of season; correct, rebuke and encourage — with great patience and careful instruction." Meaning, don't preach the wisdom of man, but preach the Word of God. And in verse three, "For the time will come when men" (the people in the pews) "will not put up with sound doctrine. Instead, to suit their own desires, they will gather around them a great number of teachers to say what their itching ears want to hear." Bible prophecy expert Don Perkins, the founder and director of According to Prophecy Ministries in San Diego, California, was asked if he believes we are living in that age of spiritual deception right now. The following are Don's responses. We're living in an age where a spirit of deception has gone out into this world and many, many people are being deceived into believing in false Christs. And, the media — printed media, TV, all of it — is playing a major role in preparing people to accept false Christs. I really believe it is being used in that capacity. I've been tracking the periodicals like Newsweek, Time Magazine and other major news magazines for probably 10 or 11 years, and what I've noticed is that around the holidays like Christmas and Easter time, there is always a periodical with some article that comes out about Jesus. And, it's always a cover article. I have many articles. I have one here from US News and World Report on why Jesus was killed entitled "Why Was He Killed?" In this article they basically say that Jesus was killed because He was a rebel — totally discounting what the Scripture said! We know that Scriptures say He was anything but a rebel. That's what some of His followers wanted Him to be, a rebel to overthrow the Romans. Well, because He didn't relieve the Roman whip off of them, many Jews rejected Him. You know, "give us Barabas!" Well, because the periodicals don't want to honor Christ from what the Word of God teaches about Him (and most of these periodicals today you see as magazines in the grocery store), I tell people all the time to be very careful, because nine times out of ten, it's not going portray Christ in a true light. And it does that very subtly. They use "scholars." Many people when they hear the term "scholar," that adds validity to the teacher or the person that's talking. Because I always know it's going to be some super-liberal who doesn't even believe that Jesus was God in the flesh. He doesn't believe in the virgin birth. He doesn't believe in the resurrection. I have countless articles. I have another one by Newsweek entitled "Rethinking the Resurrection." In this one there's a new debate about the resurrection of Christ. The article goes on to teach that Christ was not raised from the dead. Paul said, "if Christ be not risen, we are still in our sin." And, the incredible thing about it is you can still find Christian "experts" who are so-called "scholars." I believe the world is seeing a false view of who Christ is. People are not really spending time in the Scriptures to learn who He is. I made the statement in some of our conferences in regards to The Da Vinci Code, That thing was such a best seller, and many people, even Christians sad to say, had their faith shaken by The Da Vinci Code. I've made the statement many times that it was really sad that many Christians knew more about the Jesus of The Da Vinci Code than the Jesus of the Bible. The book even claimed Jesus married Mary Magdalene and had children and they all went to France — it's just absolute nonsense! When The Da Vinci Code came out, I wasn't shaken not one bit, and the reason why was because I knew that Jesus' life was prewritten in the Old Testament. Every aspect of His life in the New Testament was already prewritten, and therefore, nowhere in the Old Testament do you see Christ marry Mary Magdalene. He fulfilled every prophecy to the minutest detail. Another example of creating a false view of Jesus can be found in US News magazine in an article entitled "In Search of Jesus." Well, their conclusion again falls in the line of false Christs presenting Christ in a false light. I normally tell people, "You want to find Christ? Then spend time with Him in His Word." You know, you don't need to search for Jesus anywhere else. In Time Magazine's article "The Search for Jesus," some "scholars" are redefining the Gospel saying it's not true. I'd rather believe those disciples who knew Him, who lived with him for 3 1/2 years, who ate the very fish from the the miracle of the fish and the loaves. I'd rather believe those First Century guys who were with Him than some Johnny-come-lately scholar who claims to know Jesus. What these articles are doing is shaping the worldview of who Christ is. It's causing many questions in people's minds as to the validity of who Christ is. Here's another example from US News entitled "Who was Jesus? A New Look at His Words and Deeds." A new look at them?! Notice the title is always in the form of a question. You know what's amazing to me? I've never seen an article on "Who was Satan?" or "The Truth About the Devil" or "Who was Muhammad?" I've never seen such an article. Portrayers of false Christs will always attack the truth. Again, a false view of Christ is usually portrayed in the media. The scripture in 1 John 4:3 says in the end times that this is the Spirit of Antichrist. The articles often conclude by saying, "Well, Jesus was a great man. He was a moral man. He was a good prophet. He was a fine person, but He certainly wasn't God in the flesh." And that reminds me of C. S. Lewis's great statement where he says, "don't give me that nonsense!" That's absolute nonsense when you do that. Lewis said Jesus was either who He said He was — God in the flesh — or He was a madman, equivalent to a person who thinks he's a poached egg, because good people do not go around telling lies, saying "I am God in the flesh." Good people do not go around saying "I forgive you of your sins." He was either who He said He was or He was a madman, but don't write Him off as just some good person. But, the writers of those magazines try to do that to appease everybody. I got another article on the Jesus Seminar, that's another group of these so-called "scholars." They get together every year. They vote with colored marbles to say whether or not Jesus did this or not in the Gospels. They vote on every verse asking, "Did He say it? Maybe He said it. Maybe He didn't say it. He didn't say it." In this particular article entitled "Jesus Seminar Scholars Verdict," Christ was not born of a virgin. And this article really is blasphemy. And these are supposed to be so-called "scholars." The article goes on to say that they believe that Mary was impregnated by a Roman soldier. I mean, blasphemous! This is the diet that our society is being fed in regards to who Jesus is. And, what I'm challenging pastors and churches all over the country is that they need to get back to the Book. The Word of God is the absolute truth about who Christ is. God put in the Old Testament what He would do and in the New Testament we saw Christ's life fulfilled in Jesus. Jesus fulfilled all of these prophesies. And again, we need to get back to what the Word of God says and teaches about Him and not these so-called "scholars" who claim to know who Jesus was. It's simply a guise for their attempt to dethrone Him. This particular article entitled "In Search of Jesus," listen to what they say. "The historical Jesus is not the real Jesus." This article says that the historical Jesus, in other words the Biblical Jesus, is not the real Jesus! These are so-called "scholars" that men give credibility to. The Word of God in 1 John 4:1 commands every one of us to "do not believe every spirit, but test the spirits to see whether they are from God, because many false prophets have gone out into the world." All this reinterpretation nonsense comes out of what's called the German School of Higher Criticism. It looks upon the Bible as being man's search for God, and therefore full of myth, legend and superstition. Instead of God's revelation to man — and so their idea is, instead of reading it and believing it and acting on it — you read it and you criticize it like you're reading Shakespeare and take it apart. The result is that those who buy into it, it destroys their faith. We can see England as a perfect example because the Nineteenth Century England was the center of world evangelism and suddenly today, seven percent of the people go to church in England because the Anglican Church bought that hook, line, and sinker and began to say "Well, you know, this is man opinion, but who wants to go and listen to man's opinion?" It gets back to the post-modern society, too. This is the society where there's no absolute truth. You can believe in a Jesus like this and I can believe in a Jesus like that and everybody's happy because it all depends on feelings. I want to quote this. This was a prophecy update talking about Reverend Moon. Listen to what it says. "The world's new Christ is here, according to the Assembly of World Religions. And he is Reverend Sun Myung Moon. 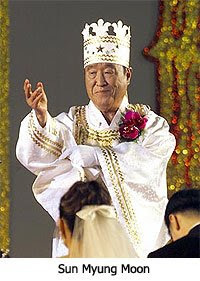 The Unification Church founder has declared that he is the new Christ. He claims to be the Messiah, the destroyer of Satan's denomination. Moon is called the father of the universe and his wife is called the mother of the universe." Listen to what he says, "because Jesus failed to accomplish His purpose." So, in other words, he's teaching today that Jesus failed in the purpose that God called Him to do. We know that that is incorrect. But again, he's a false Christ. Hundreds of thousands of people go to his events and meetings. He also marries couples. He and his wife believe that if they marry you, you are taken back to the pre-state of Adam and Eve. The scripture commands that we as Christians need to be on the alert and to test everything by the Word of God. Test it! Jesus said if they say "He is here or He's there," don't follow them. When I hear of a guy claiming to be Christ, automatically I know that it's a false Christ because I know based on the scripture how Jesus will come. I'm looking for Christ — I'm looking for Him in the Rapture! Amen and amen, Bro. Don. The thing that makes this possible is universalism. We have spiritualized "christ". There isn't just one christ, there are many. Bhudda was a "christ", Mohammad was a "christ", Jesus was a "christ", Moon is a "christ", etc. In the view of many, Jesus was just one of many Ascended Masters who, originally came from Mars, but are now originating outside our realm/dimension. We used to call them "space aliens", as in UFO's. This is what makes it possible for Obama to be christ and will make it possible for THE antichrist to be considered to be Christ. Take a breath Thunder....hee hee hee. WE know that someday EVERYONE will proclaim on bended knee that Jesus is Lord. Unfortunately for some it will be at the judgement throne when it is too late. I'm breathing, Junbuggg. I spent most of my weekend helping my dad put new trusses up. How's yours? And, I'm afraid you're right, Billy.